The Notre Dame Cathedral has long been regarded as a spiritual beacon, architectural marvel, monument to Parisian beauty and a towering symbol of French national pride. But the flames that engulfed the centuries-old structure on Monday threatened to demolish part of that rich cultural legacy, NBC News reports. "It is bone-chilling. It is heartbreaking," Caroline Bruzelius, a professor of architectural history at Duke University, said of the blaze at the cathedral, built in the 12th and 13th centuries. Notre Dame, one of the world's most visited and photographed landmarks, is inextricable from French history, Bruzelius said. Napoleon was crowned there, and it has hosted other major ceremonies in the pulsing heart of the City of Lights. It is also a global icon: the setting of Victor Hugo's classic novel "The Hunchback of Notre-Dame," the luminous backdrop for numerous films, the subject of a somber painting by Henri Matisse, and an inspiration to legions of tourists for much of modern history. Camille Pascal, a French writer and historian, said the mammoth blaze has already caused "the destruction of invaluable heritage." 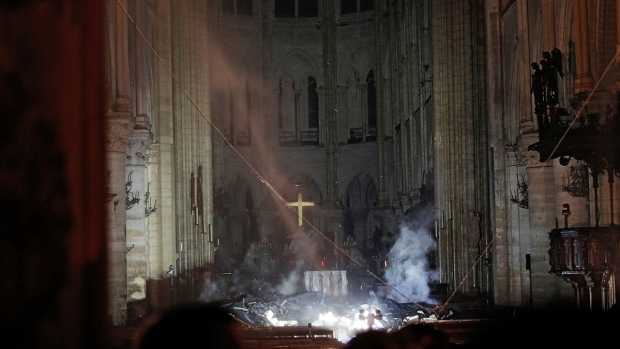 The spire ruined in the fire, like much of the cathedral itself, contained artifacts considered sacred to Roman Catholics, including a relic believed to be from Jesus Christ's crown of thorns.